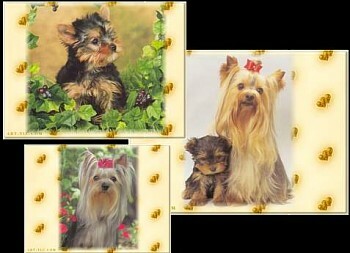 Thirteen Lovely slides of Yorkies, from Dog Fancy Magazine (Images copyright) and also a couple pictures of my yorkie, "Snickers". Music is "Bird Dog". The Yorkshire Terrier National Rescue site is worth visiting and some cute Working Yorkies Here and More Here.Screensaver copyright, ART-TLC©.